Earlier this month, Spain’s prime minister, Mariano Rajoy, was asked whether he had discussed the subject of Catalan independence during a meeting with David Cameron. The question was borne of a widespread belief that Catalonia was simply a sun-drenched version of Scotland, and thus Barcelona’s ongoing feud with Madrid had a clear resonance in this country. Rajoy was unequivocal. Catalonia and Scotland are “absolutely and totally different” he said curtly. For perhaps the first time, the Catalan people agreed with him: the reasons which underpin Catalonia’s desire for independence, a blend of historic, cultural, linguistic and economic factors, are unique. Scotland may feel it is on to a winner with North Sea oil but it cannot compare with the economic power of Catalonia, and millions of Catalans feel this power is being drained by pig-headed ministers in Madrid. Although Catalonia is a self-governing community, it is forced to pay taxes to the central government – and shoulder a financial burden far greater than any other region. 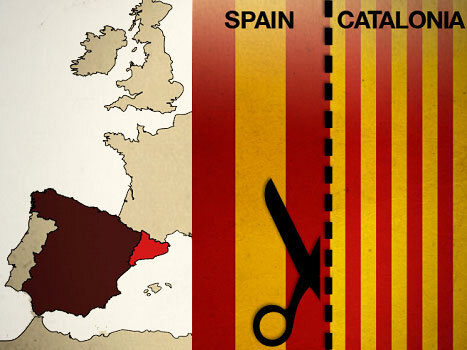 As the industrial and commercial titan of Spain, Catalonia pays far higher taxes than any other regional community. It accounts for over 20 percent of Spain’s GDP, and only 8 percent is ploughed back into it by the state. These figures are even more scandalous when one considers that the Catalan community represents 16 percent of the total Spanish population. Then there is the political motivation for independence, a casus belli with a power above and beyond any financial figure. While the Scottish Assembly is a very modern creation, Catalonia’s cultural and political institutions go back centuries: the Generalitat de Catalunya dates from 1359. Furthermore, the memories of repression and recrimination are still painfully fresh in Catalonia’s collective memory.